Professional mods do sometimes require external batteries in order to allow you to take a nice big pull, so it is great to have some with you just in case one battery loses its touch. The VTC4 3.7V 18650 Battery by Sony is a popular battery that many people use whenever they need a specific 18650 battery for their vaping endeavors. However, some of these mods do need about two of them in order for them to work smoothly. Good thing there is a two-pack available for you so that you do not have to constantly start ordering singles. If your mod just requires ones, it is still recommended to get the two-pack so that you always have a spare one ready to help you out if needed. The chemistry will be Li-Ion, the voltage is 3.7V, and the battery capacity is 2000mAh. With this much power, you will most likely have a great time enjoying several vaping adventures before you have to start charging it up. This battery will be pretty small as it has a diameter of 18.2mm and a length of 65mm. The maximum continuous discharge current will be 23A. Get yourself this trust battery and start having fun vaping again. 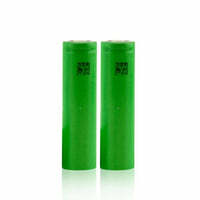 VTC4 3.7V 23A 18650 Battery - Sony has a rating of 5.0 stars based on 1 reviews.